Invergordon football team, probably taken early/mid 1950s. Some of the players are also in picture #886. Goalkeeper.... Bill Mctaggart. Front extreme left... David Bremner. Front middle... Bunny MacDonald. Can anyone help name the others? Front 2nd left Jimmy Farquhar. 2nd from right front, Johnny Miller? Not sure about far right front Davie Moir? My dad used to take me into the "Dressing Room" hut after games and I never knew where to look! The players would be washing themselves from buckets of cold water, usually brought in by Frankie Hoy. Frankie had learning difficulties and looked quite scary at times but he was really a harmless, nice man who was mad about football. On saturday nights he would walk up and down the High Street selling the "Football Times" which had the day's results in its Stop Press column. 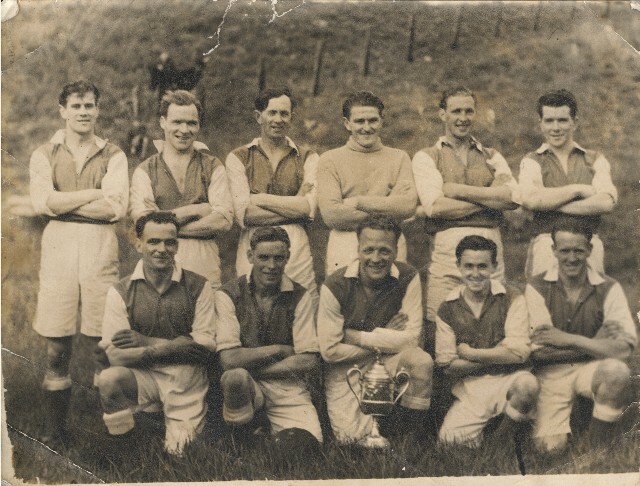 Invergordon FC had many successes in the 1950s. picture #813 which I posted some time ago shows the Trophy in this picture on our living room piano. My date of 1950 was a guess but I think the team won trophies several times in that era. The team strip was red and Bill MacTaggert usually wore a yellow jersey. The home ground was at Blackpark to the west of the Naval Playing Grounds and between the town dump and the oil tanks. I think the school is on the site today. How many kids at the school today know that their school is on a site of great historical significance? It was where sailors from the Home Fleet held a massed meeting in 1931 and voted to go on strike because Winston Churchill decided to cut their pay. The last mutiny in the British Navy! Sorry Billy but your geography is a wee bit out. Black Park is about 300 metres to the East of the "Rec" and the current Academy, the rest of your input is accurate. Black Park has been part of Invergordon Distillery grounds for a number of years as well as the old dump. The road that went from Tomich Road past the dump to the cottages has also disappeared over the years. Black Park was situated between the town dump and the oil tanks. The railway line ran between the park and the tanks. Second from the left in the back row is my Dad, Roddy Macleod the painter. Front row extreme right is my late uncle Donnie Murray. Standing behind him looks very like Ian Sutherland ..but ..am not certain about him. On the end of the back row left hand side is my dad Robert Connnell. Ross Budge, Davy Budge, John Maclaren and my brother Bobby watched a lot of games in awe. Years later when I was in Invergordon under-fifteen school team, we actually wore the strip that this team in the picture wore; it was donated to the school. I am proud to say, as centre half, I wore the same No. 5 as Jimmy Facquhar who I based my game on - it must have helped as I played centre half for the under fifteens and right half for the seniors. The late Big Jock Mackay was captain of seniors Alan Macleod, Alan Drever, Dickie Milne, David Ogilvie was keeper. Under fifteens Alex Suds, David Murray, Billy Wilson (Chess), Ronnie Ross, Eric Urquhart (Chant). I can even remember Mattie Maloy playing but alas no photos. Big Macfarlaine and Bill Smith were the guys in charge of us, sorry if I have not mentioned you - it is a memory thing, Bobby Ferguson and Charlie Ferguson, Sandy Ross, Hamish Mackay was goal keeper, if anyone has photos that would be good, I also played for Alness United in the Welfare League, Charlie Winter was my mentor. Goals: big Smithy, right-back: big Crombie, left-back: Hughie Urquhart, Johnnie Sinclair, Paddy Obrion(? ), Coutts, Charlie Winter, Johnnie Pirie, Eric Macfarlane (Faggie), Donk or Mrs Mack were in charge Oh big Finlay Mac, I think Finlay was doing his National Service when I played. I was fourteen and was brought in at times by Charlie Winter. One midweek game Charlie came down the Crawl and took me with him, he had asked mother and got the OK. We were in Fearn, I was shaking Les Lamb there so I got changed, then Mrs Mac said Tommy son take of your strip, Les has arrived. As I was taking of my shirt Charlie lost the plot, threw his boot against the wall and said “If he doesn’t play, I don’t play”. I did not know where to look or say, I like Mrs Mac and I liked Charlie. It ended up I did play. Memories are made of this - all wasted went to Dingwall my mate the was Big Joe Yates, not a football man. Joe was actually 5 years older than me; we were great mates; Strath dances came before football, ach well! A lot of these players were in the team when I was, in 1950. Jimmy Farquar took me under his wing and I became a good friend of Jimmy and his wife. Has anyone got photos of Jonny Miller and Willie Blake they could include here?